Volterra is perhaps one of the most beautiful towns in Tuscany, located in the middle of the rolling Tuscan countryside. The city center consists of winding streets, Etruscan city walls and beautiful medieval buildings. And it wouldn’t be Tuscany without delicious food! The best tips for a city trip Volterra. 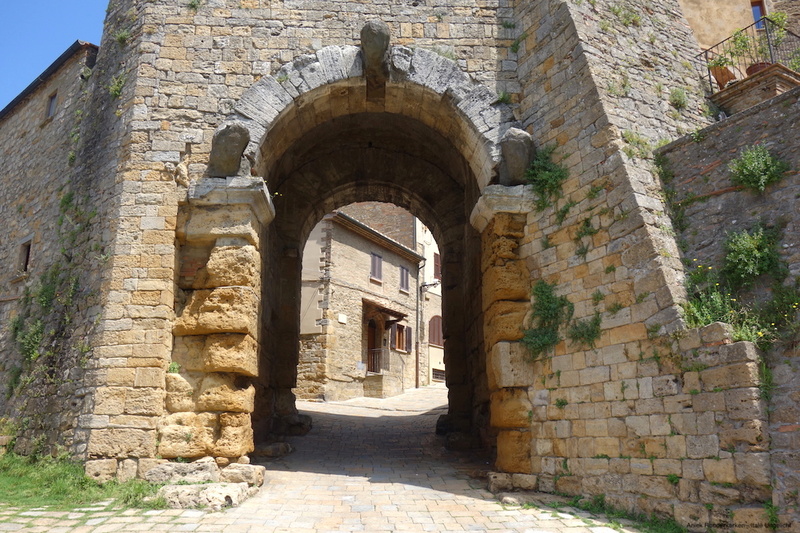 Volterra was founded in the eighth century BC by the Etruscans. In the first century after Christ the city was taken over by the Romans. The city also flourished in the Middle Ages and the Renaissance. This means that literally on every street corner you will find history. Volterra is less known than cities such as Florence, Pisa, Lucca or Siena, but it is more than worth a visit. It actually is one of the most beautiful towns in Tuscany! Narrow streets meander past old churches and palaces, and past numerous restaurants and workshops. Volterra is a compact city, and is therefore a perfect day trip from the earlier mentioned cities like Florence, Lucca, Pisa, Siena or San Gimignano. 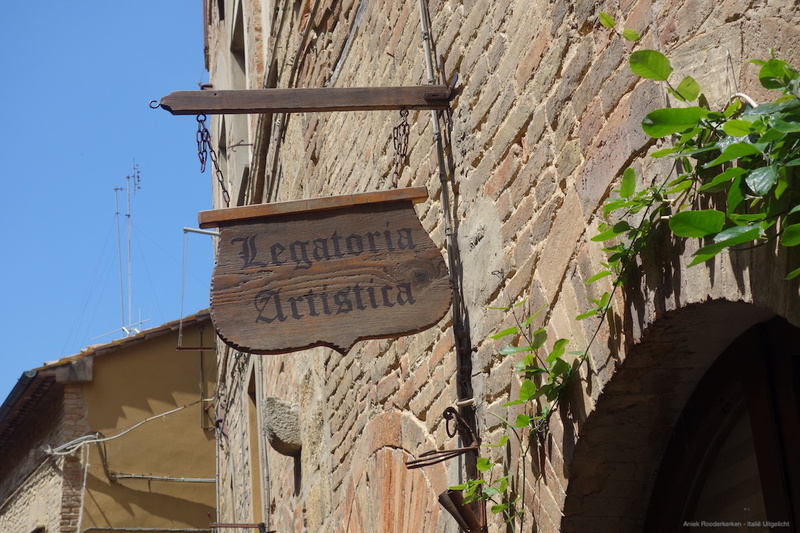 Volterra has a long, impressive history. The city was founded by the Etruscans and their traces can still be seen everywhere in the city. Nowadays, in Volterra you almost feel like you are back in the Middle Ages, so many beautiful buildings can be admired in town. Read below about the most beautiful sights of Volterra. The Palazzo dei Priori is the oldest town hall in Tuscany. It even served as an example for the Palazzo Vecchio in Florence. On the facade you can see beautiful coats of arms of glazed terracotta. These coats of arms come from the workshop of Andrea della Robbia. You can also climb the tower of the Palazzo dei Priori. You will be rewarded with a beautiful view over Volterra. You will read more about this later in this article. 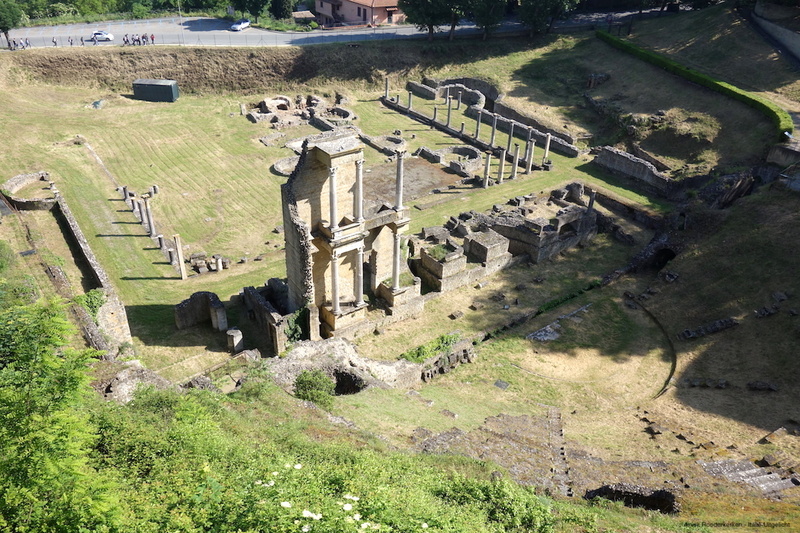 The Roman theater is located just outside the city walls of Volterra. The Teatro Romano comes from the time of Emperor Augustus and was discovered by chance when they wanted to build a soccer field here in the fifties. It is one of the best preserved theaters from Roman times. You can buy a ticket to admire the remains of the theater: the stairs, the stage and the underground corridors. You also see the remains of a Roman bathhouse that was built near the theater. But perhaps the view of the old theater is even more beautiful from the higher public road. The best view of Volterra is that from the Palazzo dei Priori. It is one of the oldest palaces in Tuscany, built between 1208 and 1257. In the Middle Ages, the Palazzo dei Priori served as a town hall and today it is a museum. 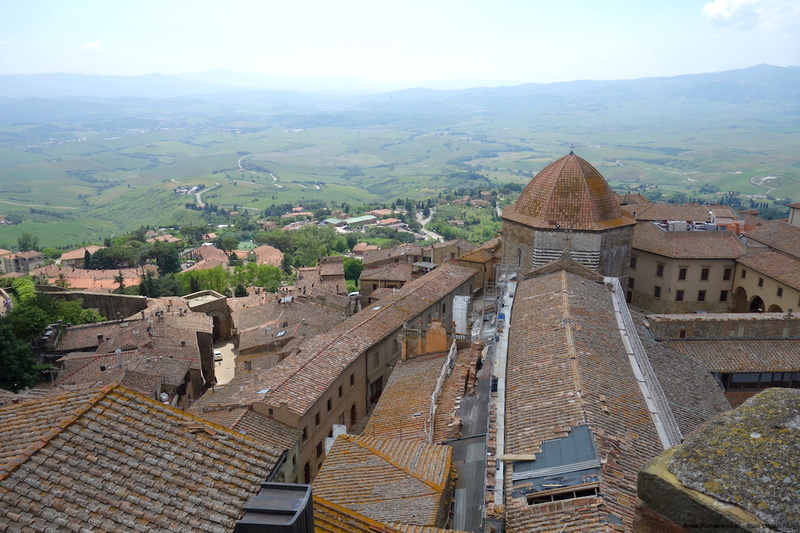 A must-do in Volterra is climbing the bell tower. The narrow climb to the top is worth the effort. You will be rewarded with a wide view of Volterra and the rolling landscape outside the city. On clear days you can even see the sea in the distance. Breathtakingly beautiful! The Duomo Santa Maria Assunta or the Cathedral of Volterra was built in Romanesque style between the twelfth and fourteenth century. Where the facades of churches from this time are usually richly decorated, due to lack of money this church lacks these decorations. The cathedral looks sober, but the interior will surprise you. The church is richly decorated with ancient art objects, marble columns and beautiful thirteenth-century pulpits with carved panels. In the Addolorato chapel are two terracotta statues of Andrea della Robbia. The Pinacoteca, together with the Museo Civico, is located in the medieval Palazzo Minucci Solaini. In this museum you can admire works of art by, among others, Giovanni Pisano, Domenico Ghirlandaio and Luca Signorelli. Be sure to take a look at the Deposition or Descent from the Cross altarpiece from Rosso Fiorentino, ‘The red-haired Florentine’. Rosso made the work for the San Francesco in Volterra. What is special is that he painted a Saint John the Baptist with red hair! An alabaster atelier has also been recreated in the palazzo, where you can discover the history of alabaster craftsmanship. What is special is that although the city is situated on a hilltop, water has been flowing for centuries in various places in the city. 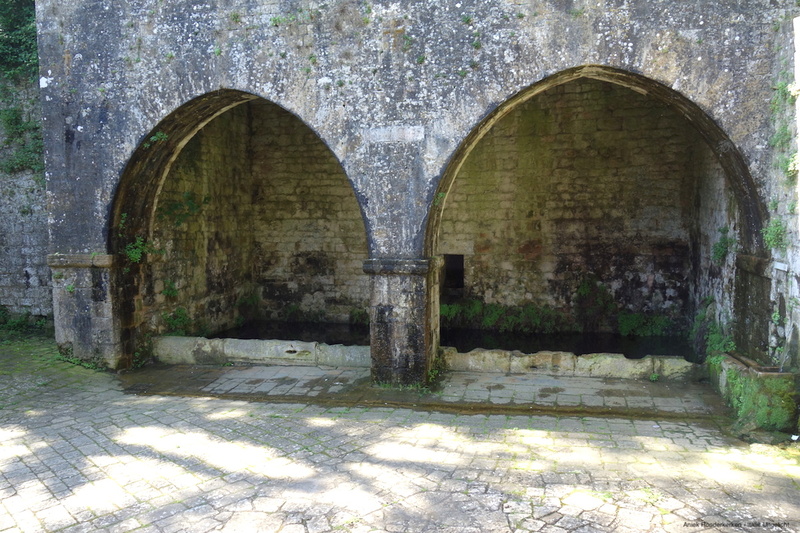 Hidden away in the old city center, and near the Roman theater, you can find the old water basin Fonte di Docciola. Rainwater was collected and stored here. Mind that if you want to go back to the center, you will have to walk up quite sopms stairs again! Volterra was founded in the eighth century BC by the Etruscans, on top of a rocky hill. You will discover everything about these ancient mysterious inhabitants of Tuscany in the Museo Etrusco Guarnacci. 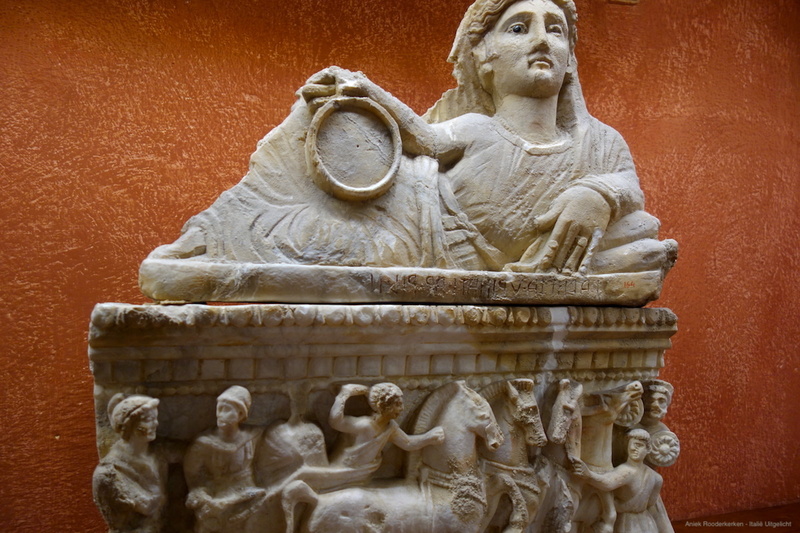 This is one of the best museums in Europe for Etruscan art. In the 26 rooms you discover objects found in Volterra and surroundings. World famous is the Ombra della Sera, a bronze statue from the second or third century BC. The poet Gabriele d’Annunzio called it the ‘Shadow of the Evening’, since the statue is long and stretched just like shadows. You will also find hundreds of burial stones in which the ashes of deceased Etruscans were kept. The best known is the Urna degli Sposi, on which you see a couple who are at dinner. Volterra is known for its alabaster. Beautiful sculptures, utensils and souvenirs are made of this white, delicate stone type. The city therefore is stuffed with small workshops where you can buy alabaster works. Do you want to see with your own eyes how alabaster artists work? Then visit alab’Arte. This is the workshop of Giorgio Finazzo and Roberto Chiti. They have been working with alabaster since the age of eighteen and they are happy to show you how they can make the most beautiful works of art out of the stone. Watch this video for a stunning preview! Volterra is surrounded by seven kilometers of Medieval and Etruscan city walls. The Porto All’Arco is the only port handed down from the time of the Etruscans. Three heads have been placed on the gate, nowadays heavily damaged by wind and weather, of which nobody actually knows the meaning. The wall you see here has been rebuilt by the Romans. 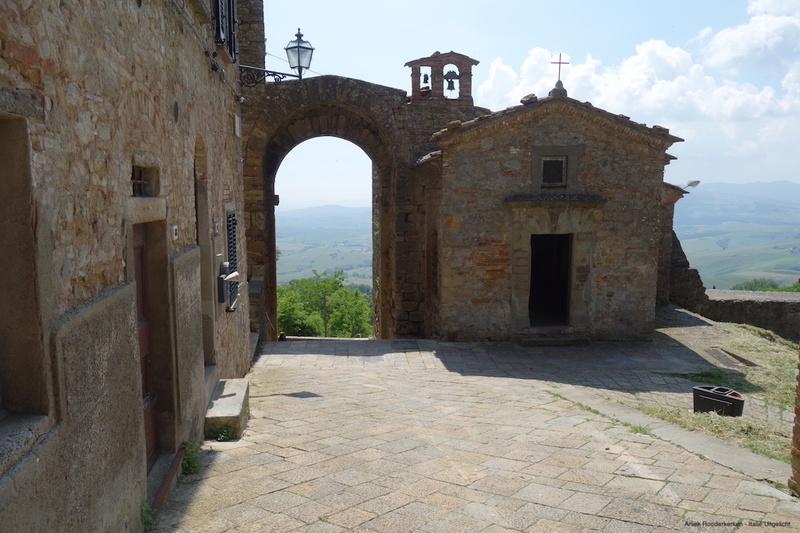 Centuries later, when the Germans wanted to blow up the gate during the Second World War, the women and children of Volterra filled the gate with paving stones from the surrounding streets. That way they managed to save the gate! In a shop window on Via Porta all’Arco you can still see pictures of this rescue operation. At Ristorante Da Beppino during a pasta workshop you can learn how to make fresh pasta yourself. Reka Sumegh shares her recipe for pasta dough and shows you how to make tagliatelle, orecchiette, spaghetti alla chitarra and pici. After the workshop you can immediately join the restaurant for a delicious dinner. On the website of Da Beppino you can find all information about Reka’s pasta workshop. The Medici fortress served as a prison for centuries, and that function hasn’t changed in all those years. Even today, there is still a prison in the fort. You can not visit this place on a regular basis, but you can take a look at the building during a city walk. Every now and then exclusive dinners are served in the prison of Volterra, the so-called Cene Galleotte. At VolaTerra you can buy the most delicious delicacies. From olive oil from the shops’ own olive grove, wine and pasta, to cantuccini. You can also have a good lunch. For example with delicious antipasti such as lonzino with vin santo, bruschetta with lardo and cheeses from the region. You can also taste pappa al pomodoro and the real Zuppa Volterrana. 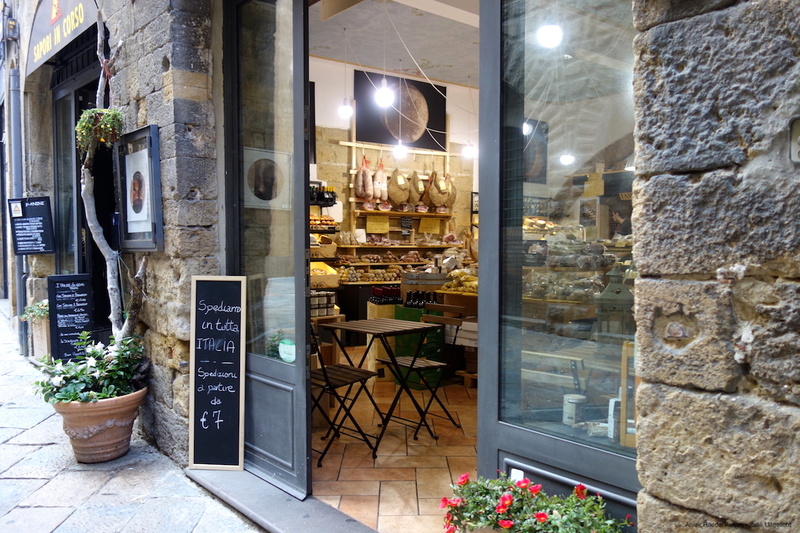 In Volterra you will find quite a few restaurants where you can taste the real cuisine from Volterra. Ristorante Etruria on Piazza dei Priori is recommended since over here you can taste typical Tuscan specialties. The Tuscan pici, thick and hand-rolled spaghetti, and salsicce with fagioli all’uccelletto. Ristorante Da Beppino on Via delle Prigioni isn’t just the perfect spot for a pasta workshop, you’ll also have the opportunity to taste some delicious dishes. Again, the real Tuscan cuisine is on the menu. Of course you have a wide choice of fresh pasta, but also wild boar with fagioli all’uccelletto and cinta senese. 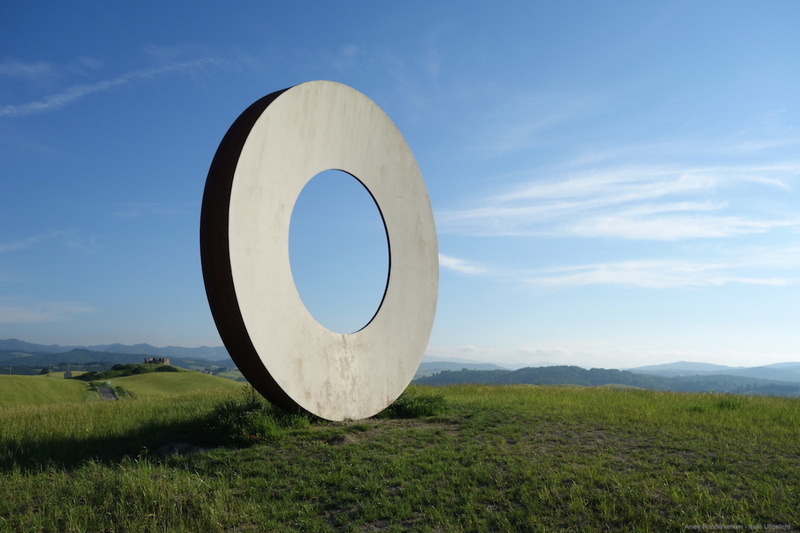 In the vicinity of Volterra there are several of these peculiar objects in the landscape. These are the so-called Luoghi d’Esperienza, large circles that stand upright in the landscape. They were created by local artist Mauro Staccioli who was born in Volterra. The Volterra area is rich in raw materials such as copper and alabaster. Montecatini Val di Cecina is a small medieval village not far from Volterra. Here you can visit a former copper mine. Under the supervision of a guide you descend to the old mine shafts and get to know the story of the miners and the history of copper mining. Read a report of a visit to the mine here. Along the coastline of Tuscany you can find traces of the Etruscans everywhere. Excavations, museums full of artefacts and necropolises in the pine forests. 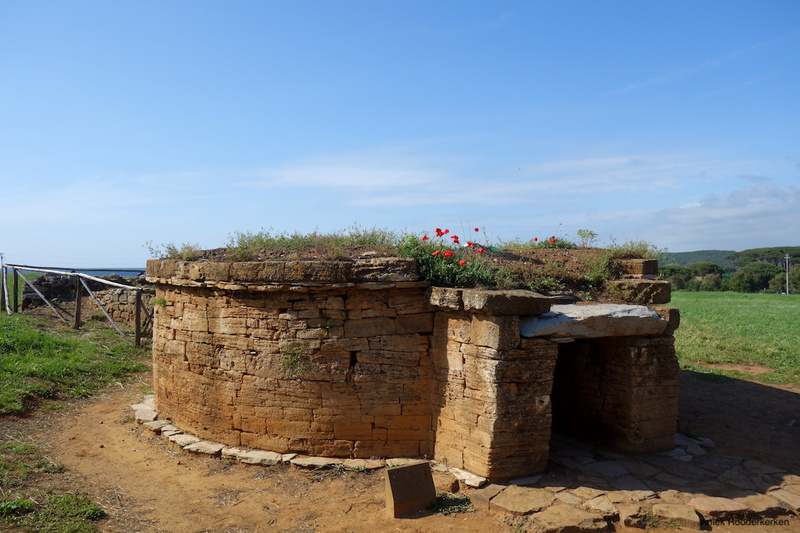 For example, visit the Parco archeologico di Baratti e Populonia, or the Etruscan necropolis of San Cerbone in Populonia. The Parco naturalistico delle Biancane in the Maremma in Tuscany has been known for its volcanic activity and hot springs since ancient times. The heat of the core of the earth has reached the surface of the earth. This ensures that you can see plumes of steam coming up all over the landscape with a temperature of about 100 ° C. You can read about the hiking routes in Parco Naturalistico delle Biancane in Tuscany. In the vicinity of Volterra you will find rugged, layered cliffs that determine the landscape: le balze. From the Porta San Francesco you can make a beautiful walk, where you can see these special rocks scattered in the landscape. You will also come close to the Badia, an eleventh-century abbey surrounded by le balze. The airports of Pisa and Florence are the closest to Volterra. For example, you fly with KLM or Transavia. If you want to combine a number of Tuscan cities it is recommended to rent a car. I always recommend renting a car via Sunnycars, for example at the airport of Florence or Pisa, since SunnyCars is the only company with all insurance policies included. In Volterra you have a wide choice of hotels and Bed & Breakfasts. Recommendations for hotels in Volterra are Hotel San Lino, which used to be a monastery, Hotel La Locanda and B&B Albergo Etruria. Outside the city you can stay at Agriturismo alle Rose and Villa Rioddi. In addition, the website visittuscany.com is a good starting point for your trip. Do you have any more tips for Volterra? Let us know in the comments!